Home Tags Posts tagged with "What is ISO 8601 Date Format"
As we welcome in the new year, if you are like us, you might struggle to remember the new date, let alone the order it should appear in when you denote it. The transition from 2018 to 2019 can be a headache, but did you know that ISO has a standard for that. Yes, even the date has a proper format, and it’s laid out in ISO 8601, the Date and Time Format Standard. ISO 8601 presents dates and times in a standardized format thereby removing confusion in international communication. 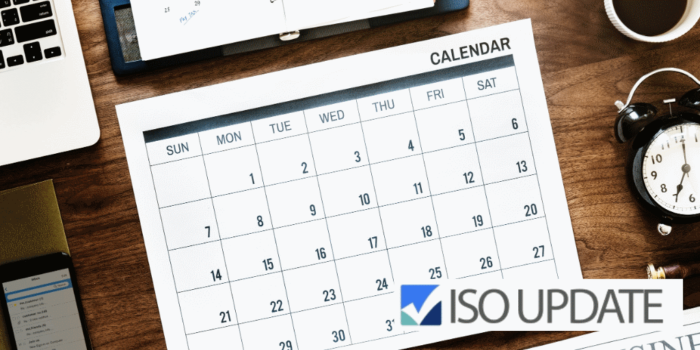 ISO 8601 is the international standard for recording and denoting dates and times using numbers to avoid confusion from different interpretation. What is the ISO 8601 Date Format? The internationally agreed way to represent the date is YYYY-MM-DD. +|- = time zone designator (Z or +hh:mm or -hh:mm), the + or – values indicate how far ahead or behind a time zone is from the UTC (Coordinated Universal Time) zone. The first edition of the ISO 8601 standard was published as ISO 8601:1988 in 1988. It unified and replaced several older ISO standards on various aspects of date and time notation: ISO 2014, ISO 2015, ISO 2711, ISO 3307, and ISO 4031. It has been superseded by a second edition ISO 8601:2000 in 2000 and by the current third edition ISO 8601:2004 published on 2004-12-01. ISO 8601 was prepared by, and is under the direct responsibility of, ISO Technical Committee TC 154.